If you’re like most people, you think sustainable design and construction are strictly contemporary concerns practiced by architects who advocate environmental stewardship. (Green design is actually mainstream now. And that’s a good thing!) Today’s home and building owners welcome the associated cost savings and take pride in knowing they’re doing their part to preserve the natural environment. 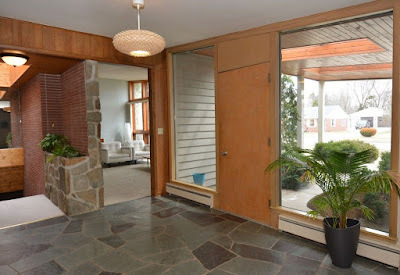 What you may not know is that many mid-century modernist (MCM) architects – way back in the 1950s, ‘60s, and ‘70s – factored principles of sustainable design into their residential projects long before the practice acquired its “green” moniker. Their homeowners reaped the benefits, oblivious to the concept of “eco-friendly” design. To them, their homes were even more pleasant and special. A standard element of sustainable design today. 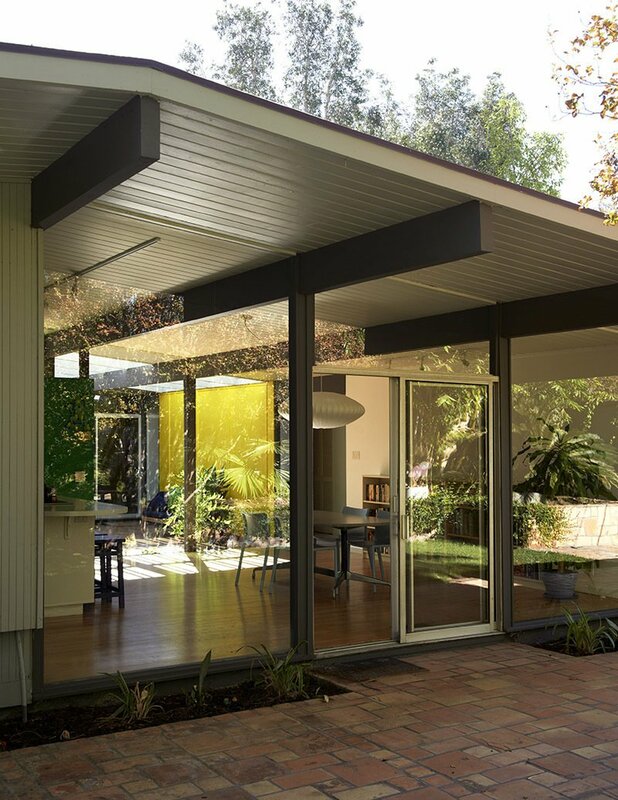 In the early- and mid-20th century, modernist architects had to devise a method for protecting all those wonderful walls of glass and horizontal bands of windows from the high, hot summer sun to reduce glare and heat gain on the interior. Heavy draperies were not an option. The solution to the problem was to make the roof overhangs extra deep, at least by three feet. In the winter when the sun is lower in the sky, light and welcomed warmth would slip under the overhangs. Of course, this practice is even more effective since the advent of energy-efficient windows. 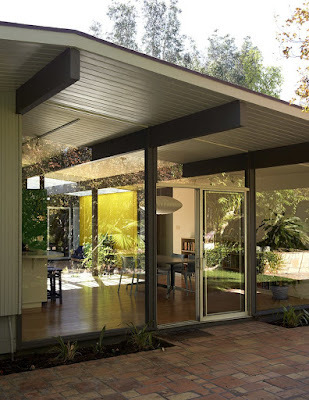 MCM architects had nothing but inefficient single-pane glass for all the glazing and windows on their houses – which made deep roof overhangs vitally important. Another method for minimizing the separation between outside and inside was to maximize natural light and ventilation. We now know this principle greatly reduces a house’s dependency on electrical lighting and air conditioning, reducing both the cost and the house’s carbon footprint. It goes without saying that the glass that helps define all modern houses flooded MCM interiors with natural light. But the glass was fixed in place. Not a problem today – unless you care about energy conservation -- thanks to air conditioning. But before HVAC systems made it possible to stay cool in a windowless office warren, ventilation was a major concern. 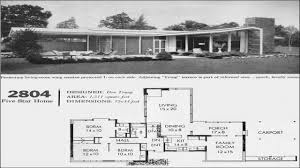 So a modernist architect might tuck a row of operable windows along the bottoms of the glass walls and place sliding horizontal windows, for example in strategic locations on the opposite side of the house. * When both were open, cooling breezes swept through the house. Today, “green” architects care about cross ventilation so homeowners can turn off the air conditioning at certain times of the year and enjoy the natural breezes. Or year-round in perfect-weather locales like L.A. and Hawaii. Most MCM houses, especially the more modest ones for “everyday” folks, had narrow footprints. They might even be long, yet only one-room deep. This was – and still is – a very efficient, eco-friendly design in terms of energy savings. Natural light can permeate the entire interior and operable windows on either elevation make natural ventilation a snap. Radiant heat from masonry elements (see above) can also impact more of a house with a narrow footprint. 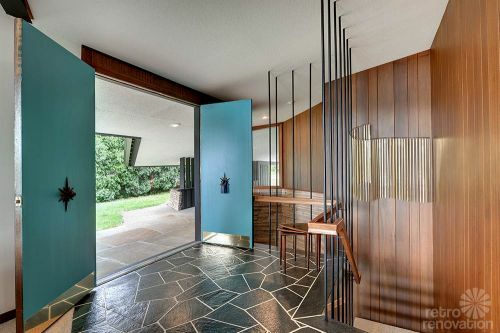 All of the above is just more evidence of early- and mid-century modernist architects’ brilliance. They were ahead of their time. About that last point: In a future post, we’ll discuss how being ahead of their time frequently caused a host of headaches for those brilliant modernists and the people who lived in their houses.